Marketers and business owners have been comfortably adopting a ‘data-driven’ mindset for a good number of years now. Many will be feeling pretty secure in the knowledge that they have updated their systems. For example, you may have already invested in the latest marketing automation tools to alleviate monotonous tasks and boost the exposure of your digital marketing efforts. Further, you may have also encountered the latest voice recognition technologies, such as Alexa. These tools help you perform a range of different office commands including setting appointments, ordering goods, and updating systems. 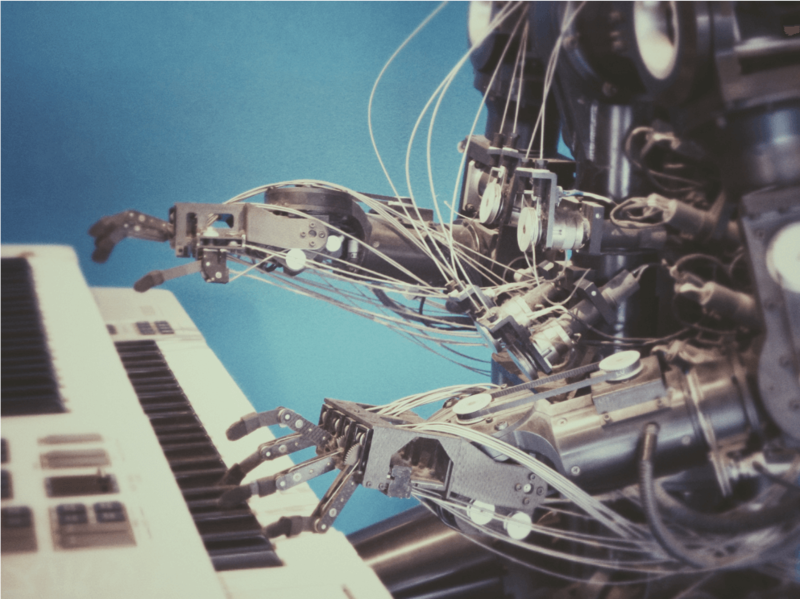 Perhaps you may have even glanced at some of the headlines on robotics and how machine learning will eliminate the jobs market across all industries. Alarmingly, some statistics on this growing ‘digital skills gap’ reveal that 85% of the jobs that will exist in 2030 have yet to be invented. For instance, already we have robotic technologies that can successfully diagnose and perform surgery on humans. We also have market-predicting tools that have wiped out nearly a third of the jobs on Wall Street. Therefore, this ‘machine takeover’ may impact both high and low skilled workers sooner than we think. So how can you make sure that you are using AI and machine learning (ML) in a way that will benefit you now, as well as future-proof your marketing efforts in the years to come? Read on to find out more about how AI and machine learning can transform your digital marketing output. As marketers, we’re used to skilling-up and learning how new programs and media conventions work. It becomes almost like a second nature to keep one eye firmly on the latest trends and undergo training in areas we are less familiar with. In self-development circles this is known as the ‘growth mindset’. Your knowledge base and outlook should be constantly ‘growing’ and expanding, rather than stuck in rigid ‘tried and tested’ formulas. Cultivating a growth mindset in the years to come will doubtless present a steep learning curve that runs alongside the rapid development of this cloud-based technology. However, with new knowledge comes new creative ideas. Innovations that will help you stay ahead of the competition and explore new, profitable opportunities. The perfect example of this is the adoption of mobile and social media marketing strategies over the last decade. A mobile-first approach to drawing in consumers is as ubiquitous now as machine learning could be within the next five to ten years. With AI and machine learning, it is the aim of business leaders to look at the potential impacts on their industry and their direct competitors. The capabilities of AI and ML have not yet been fully realised. However, tools like Google DeepMind enable businesses to build customised programs that can pull large sets of data inputs and outputs and then intelligently create patterns between them. Supervised Learning – Where models learn based on large sets of labelled input data. For example, image recognition categorisation, as used on sites like Pinterest. Unsupervised Learning – Unlabelled data is gathered. From this data set, the machine creates its own associations, using methods like clustering and searching for anomalies. Amazon, for example, pulls recommendations based on what customers have also bought. Semi-Supervised Learning – A mix of labelled and unlabelled data input used to draw patterns of association. Reinforcement Learning – Limited input data is used to make predictions and the algorithm adjusts based on positive or negative reinforcements in its decision-making. Swatting up on programming languages like Python, Java, R and C++, data processing (SQL and NoSQL) will get you used to algorithms and the templates used to build the ML problem-solving models. From here, data scientists can advise on tweaks to bring in optimal results. Additionally, from a design perspective, training in UX and UI design may also help you get to grips with the aesthetic and usability needs of your customers and staff. The big selling point of machine learning, from a business perspective, is the ability to use technology to anticipate your customers’ needs and present them with an efficient, highly personalised service. In the first instance, you will need clear goals to create workable hypothesis for development and testing. Areas where your staff input their specific knowledge to help close a sale. You could look for ways you can make this workflow more efficient with machine learning. Decisions made along your supply chain. Can an automated program examine the right set of data and make a reliable choice, to further along production quicker? To optimise your processes you will need to have a good understanding of big data, i.e., what you can collect and analyse. Services like Growfit, for example, uses AI to help identify potential customers. From here, the system then targets contacts with effective email campaigns, to help your sales team land more qualified leads. Simillarlarly, chat bots have exploded in use over the past year. Automated chat services can help guide website visitors to make informed purchasing decisions. Pre-programmed responses can answer any questions, and reassure customers when required. Further, the data collected from input can point business leaders towards service improvements over time. Machine learning can also be used to build innovative new tools that will allow your business to develop valuable digital assets and scale up your marketing output. They can even be utilised develop entirely new products and services that can really shake up your industry. Once you have examined the potential for AI and machine learning, the next step is to get in touch with a data scientist. You will also need to meet with stakeholders to help you finalise your data frameworks and develop the artificial intelligence you need to serve your customers to the highest standard. Additionally, in hiring any kind of UX or UI designer to help you formulate your new sales funnels and customer experiences, you will also need to research with your real-life customers. In meeting their expectations, ensure that your products are tried and tested with real people. Data selections and suggestions that arise from your machine learning models may not match the expectations of your viewers. Make sure you seek their input at multiple points in the development phase to get the right fit. Marketers and business leaders should take note that the technologies and potential of AI and ML needn’t be the reserve of multinationals with unlimited budgets for tech. As solutions are cloud-based, the possibility is accessible to even small startups with the right expertise to experiment and grow as a business. Getting to grips with it now will help you stay ahead of the curve.